An outfit worn by Vivien Leigh in the film Gone with the Wind has been sold for $137,000 (£91,000) at an auction in California. Ms Leigh won an Oscar for her portrayal of Scarlett O'Hara in the 1939 movie. 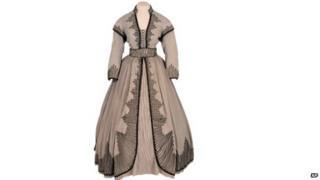 Heritage Auctions said the grey jacket and skirt worn by the actress were among 150 items offered by collector James Tumblin. He originally bought the outfit for $20 from a costume shop.